Studio Ghibli's 1993 production, Umi Ga Kikoeru (I Can Hear the Sea), is a superb example of animation in the service of naturalism and neo-realism. 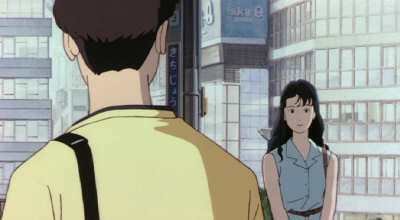 The teenage drama, which veers from anxious romance to open-eyed nostalgia, provides another excellent example of what animation can achieve in the service of drama. It's a lesser-known work in the studio's canon, mostly because the DVD has yet to be released outside of Japan, but it deserves equal billing with its older siblings, Grave of the Fireflies, Omohide Poro Poro, and Mimi o Sumaseba. In a sense, I Can Hear the Sea represents everything that Miyazaki and Takahata sought to achieved when they founded Ghibli in 1985. Allow me to explain. When Studio Ghibli was founded, one of the things Miyazaki and Takahata wanted to change was the working conditions within Japan's animation community. Traditionally, an animation team would be assembled for a specific project, but would be dissolved after its completion. For many people, there was little job security, moving from one project to the next in an almost temp-like fashion. The old masters wanted to change this. They wanted an environment which could nurture and raise the next generation of animators. Ghibli ushered in a new wave of reforms. Employees would be paid a living wage. They would be hired permamently, not merely hired for one gig and then let go. This committment to share the wealth was a generous move for Ghibli, especially when you consider that the studio's first three films - Laputa: Castle in the Sky, Grave of the Fireflies, My Neighbor Totoro - were not box-office hits. The first movie to pull in a profit was Kiki's Delivery Service in 1989. Perhaps most importantly, Ghibli also established a school for training the younger employees. Both Miyazaki and Takahata taught classes, imparting their wisdom and sharing the techiques in filmmaking and animation that made them world-famous. Soon, the kids would be set loose upon the world. I Can Hear the Sea was the fruit of those labors. The project was handed to the newer kids, and the television format guaranteed that there would be less pressure upon them. Perhaps it's also a nod to their teachers' own experience; they began their careers on Toei TV shows like Hustle Punch and Wolf Boy Ken, and became masters of the form on Heidi, Girl of the Alps, and other television dramas of the '70s. In any case, Umi is an accomplished work, and doesn't feel at all like a student work. It's focused, firmly paced; the many characters are given a considerable depth and avoid all the typical teenage romance cliches. Clearly, it's heavily infused with Takahata's naturalist style, with its objectivist portrayal of the main characters, and the many pillow shots which point back to Ozu. The animators had worked on Omohide Poro Poro two years before, and they absorbed that film like a sponge. The director's chair for Umi Ga Kikoeru was filled by Tomomi Mochizuki, an outside director best known for his work on Here is Greenwood and Kimagure Orange Road: I Want to Return to That Day. Like the staff, he was a young up-and-comer, and his sensibilities fit perfectly with what the story requires. He was already committed to the Here is Greenwood TV series, and the resulting stress of directing two productions simultaneously took its toll on him. Fortunately, he succeeded on all fronts. This was the first Ghibli production with an outside director, and it presages later director work by Yoshifumi Kondo, Yoshiyuki Momose, Hiroyuki Morita, and others. It's also the beginning of the great crisis for the studio, namely, Who Will Be in Charge When the Old Masters Retire? We'll be coming back to that one again sometime. "And it was then that I realized...I had always been crazy for her." Umi Ga Kikoeru finishes with a climax that's truly moving, a dramatic punch-line after a long, engaging story. More likely than not, it's the scene that will linger in your mind the longest. At least, that's been the case with me; it's a grand, sweeping romantic gesture, literally sweeping. It's a great construction. The whole film is building, building, building to the climax. Anyone who knows drama or comedy, truly knows it in their bones, will tell you how important it is for the punch-line to contrast against the set-up. This is a crucial lesson for anyone who wants to write novels or make movies. Something like this just isn't possible from today's brain-sucking Hollywood blockbusters. There's never any contrast, any proper build-up; no, it's all punch-line. It's all endless explosions and rapid-fire cuts. BoomBoomBoomBoomBoomBoomBoom!!!!! Kids, this is why Master of Puppets is vastly superior to Kill 'Em All. It's all in the contrasts, the tempo shifts. The climax to I Can Hear the Sea is a textbook lesson, taken straight from Yasujiro Ozu. Ozu became the master of zen filmmaking, of stripping away every excess, every concept, every notion. All that's left is the pure, unnamed experience. Notice how scenes are assembled, with its casual pace, its long shots, its endless pillow shots. This brings us not only closer to the characters, by moving everything in a real-time tempo, it also allows us to contemplate, to meditate, to reflect. Umi is mostly told via flashback. Notice how every shot is a static shot. The camera never moves once. And then we return to the train station, right where we began. Taku had once spied a girl he believed to be Rikako; now, having come to terms with himself, he spies her again. He won't let her get away this time. He sprints down the stairs, across the subway, and then up the stairs to the other side. Running out, he looks around, but cannot see her. And then Taku turns his head. His eyes are fixed, the sounds of the train station melt away, and the camera swings around, sweeping in a circle to meet Rikako, who waits, smiling. Punch-line. Checkmate. After an hour of stationary cameras, we have a circular rotation, 180 degrees in two cuts. It's an emotionally-charged climax, and it's about as satisfying a payoff as one can ask for. It's only possible when in concert with the rest of the film, and its long, slow buildup. A remarkable lesson learned from the young Ghibli staff - two degrees removed from Ozu.